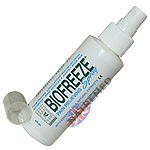 BIOFREEZE spray contains herbal extracts which are used around the world in various health and wellness formulations. The result is a fast-acting, deep penetrating, long lasting pain reliever. BIOFREEZE can effectively help relieve pain from sore muscles, muscle sprains, back, shoulder, neck pain, arthritis, painful ankle, knee, hip and elbow joints, and muscular strains and can be used to relieve pain prior to ultrasound treatments, massage therapy, soft tissue trigger point therapy, rehabilitation exercises and pre and post workout stretching. 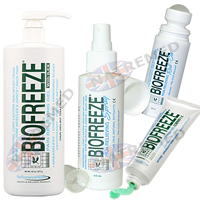 Using 100% Natural Menthol & 100% Natural Essential Oils & Natural Extracts the Biofreeze CRYOSPRAY relieves the pain without the burn of other sprays. Using Arnica & White Tea Extracts the New spray provides the strongest pain relief without a prescription and is easy to apply, sprays at any angle and penetrates immediately for deep pain relief. The spray application is the newest way to create a no touch method of application for Biofreeze. Even though Biofreeze through any of the other application methods (Gel or Roll-On) is beneficial for acute pain, the spray is particularly beneficial for acute conditions involving severe muscle spasms of the lower back or acute spasms of the upper back or neck. Biofreeze Spray can be applied pre-treatment to acute areas of muscle spasms to allow for a faster relaxation of muscle involvement and better treatment response. For use in treatment rooms or home use.